What do you get when you put a group of 16 – 24 year old Cornish apprentice chefs that are in need of a second chance together in a kitchen? Fifteen Cornwall, of course. Founded by the one and only Jamie Oliver, Fifteen Cornwall allows apprentice chefs to learn how to cook. And well. Situated right on the beach at Watergate Bay, customers are treated to magnificent uninterrupted views of two miles of Cornish beach whilst enjoying lovingly prepared Italian style dishes using the finest Cornish seasonal ingredients. We took advantage of the Tuscan themed three course set menu for £19.95 per person on our visit. We ordered the roast crown prince squash and oregano soup with Vulscombe goat’s cheese (£7.25 if purchased separately) and the cotecchino sausage, lenticchie di castelluccio and the best salsa verde (£7.75 if purchased separately) to start, followed by Fifteen’s amazing seaside taglierini, Amalfi lemon and chilli pangrattato (£17.75 if purchased separately) and crispy fillet of Cornish grey mullet, herby charlotte potatoes, cime di rapa and lemon aioli (£17.95 if purchased separately) for main. For dessert we went for the Amalfi lemon and poppy seed cake with orange curd and gooey clotted cream (£6.40 if purchased separately) and wild flower honey panna cotta, poached pears and semolina biscuit (£6.40 if purchased separately). The sausage dish arrived first and it was a good job that we had decided to share everything because it was completely demolished by the time the soup arrived. The delay was apparently owing to an error with the order printer in the kitchen. 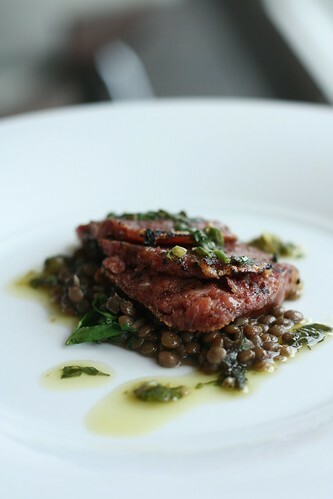 The sausage was mild and creamy with just a hint of nutmeg and the salsa verde had a garlicy punch, which matched the sausage and crunchy lentils perfectly. 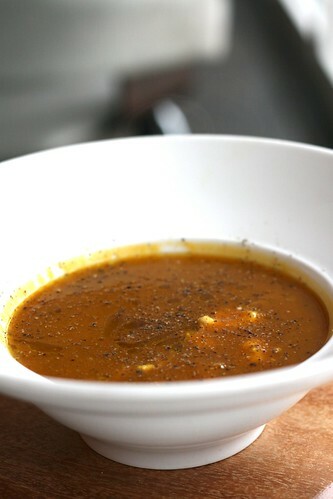 When the soup finally arrived, it was polished off within a matter of minutes. It looked beautiful, had a subtle hint of oregano and the dollop of fresh goats cheese that sat on top was irresistible. Next to arrive were the mains, we were happy to find, at the same time. 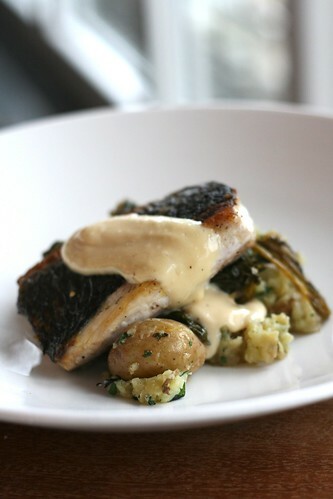 The Cornish gray mullet was soft and tender, the lemon aioli slightly gloopy but overall a pleasant dish. The same unfortunately cannot be said for the seaside taglierini – it was definitely not amazing as the menu had claimed. 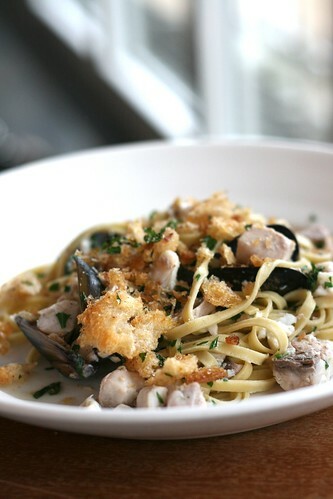 The pasta was dry and undercooked with practically no sauce, the fish dry and the accompanying croutons hard. We asked for a drizzle of chilli oil but were told that the chefs do not use chilli oil and we were not offered any alternative. Having not been blown away by what would have been very expensive mains had we not opted for the three course offer; hopes for the desserts were not high. But they were quick to prove us wrong. The panna cotta was smooth, silky and creamy, although it wasn’t easy to detect the wild flower honey. 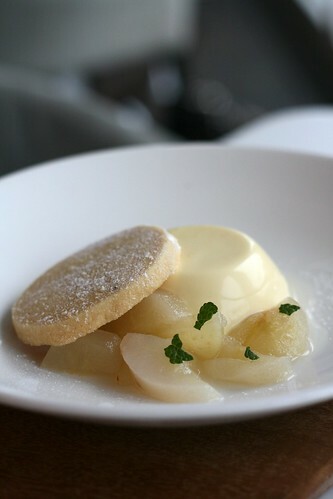 The semolina biscuit resembled buttery shortbread and the poached pear slices were tender, sweet and subtly spiced. 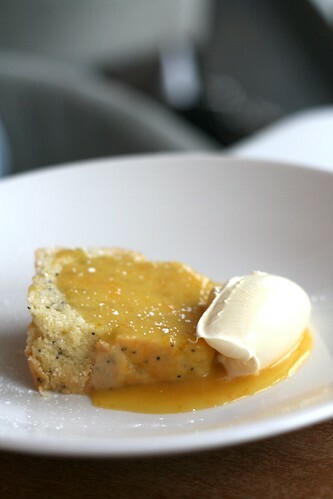 My mouth waters just thinking about the lemon and poppy seed cake with orange curd and clotted cream. Naughty, decadent, sweet and tart, the dense cake dotted with black and beautiful poppy seeds was a total winner. As we exited the restaurant, we walked past the wide open plan kitchen and spotted a chef plating up a seaside taglierini dish, which looked to be a lot less dry than the dish that we received. It actually looked very good. Maybe we were just unlucky. Thankfully the desserts were enough to create a lasting memory. I will definitely go back if I’m around the area again but I think I’ll stick to the set menu as it provides great value for three courses. The Fifteen Cornwall three course menu costs £19.95 per person. From 3rd – 10th February, customers can enjoy the Wild Cornwall menu.